Mount Pleasant Granary - Thursday 16th. October, 2014 – A Day out for the boys! Up and walked Mix before breakfast. Tom and David arrived and we climbed into David’s Jaguar and set off for our day out, all dressed in good clothes and looking as if we had never even seen a boiler suit or dungarees in our lives. The purpose of our journey was to visit Amble, a small port on the coast of Northumberland where we thought that we might be allowed to berth Olivebank next year. The drive took seventy-nine minutes – Tom was operating a stop-watch – and when we arrived we were immediately taken both by the marina and by the welcome we received. We explained that our plan was to bring Olivebank next year and then the following year, if everything went well and we had completed her refit, we would bring Ianthe. We were given a pass to enable us to explore and we were shown exactly where we could have a pontoon for Olivebank. It was everything we could have wished. The marina also has everything we could want – excellent pontoons, a serviced radio on channel 80, first rate toilets and a chandlery. There isn’t any food but just outside the marina within very easy walking distance there are lots of facilities. We tried one out and each had a late breakfast, served in a frying pan -- it was a breakfast-wish come true! We went back to the marina to say our good-byes, leaving our name pencilled in for a berth next year. Now we drove to Eyemouth just to check out the one facility which is nearer to home. Eyemouth is a large industrial fishing port but there are some yachts. So we made our way to the harbour master’s office to discover that he was on holiday. However, we were welcomed by a lovely lady in the secretarial office. She assured us that we would be made welcome but that the unserviced pontoons were already very full (but she was sure the harbour master would fit us in). The serviced pontoons have more spaces but are much more expensive and provide facilities which Olivebank couldn’t use (different for Ianthe). The real advantage of Eyemouth is that it is just twenty minutes away, the drawback that it might take us that saved hour to disentangle our boat and start sailing. 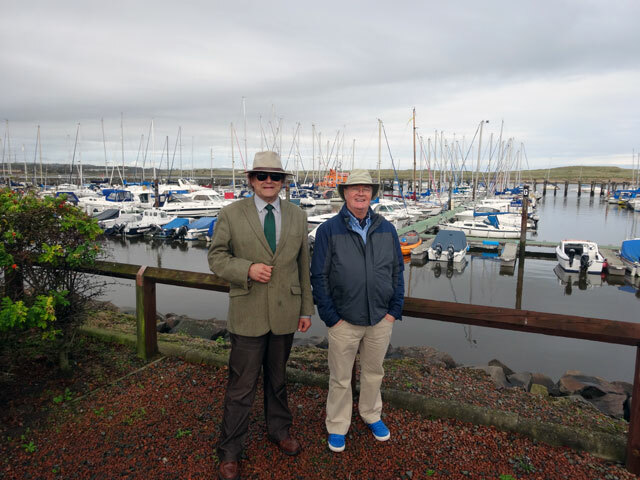 Having experienced marina life before (at Port Edgar and at Inverkip) I really fancy a season at Amble – and, of course, now that we are retired we could stay there and not bother coming home in the evening. It would also be a convenient break in the journey to Chester-le-Street to watch the cricket. So my heart says Amble, my mind realises that Eyemouth is nearer at hand. We shall see. Back home, Tom was collected by Dorothy and Rachel had returned from her glass class. Mum had done some organising and I dealt with some emails. We all dined in the farmhouse and then Rachel went off to her choir while I wrote a letter and thought about boats. On Rachel’s return we watched the News, walked the dogs and went to bed to dream about boats. It has been a wonderful day.